Originally from Portland, Oregon, Jen Currin has lived in East Vancouver for fourteen years. She rides her bike nearly everywhere and has gotten better at growing vegetables in her community garden plot. 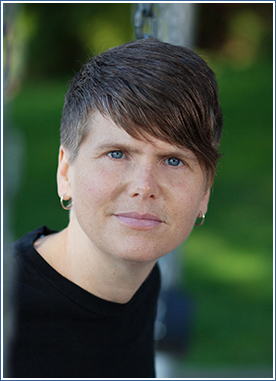 Jen teaches creative writing and English at Kwantlen Polytechnic University. She has published four books of poetry, including The Inquisition Yours, which won the Audre Lorde Award for Lesbian Poetry in 2011; and School, which was a finalist for the 2015 Pat Lowther Poetry Award, the Dorothy Livesay Poetry Prize, and the Relit Award. Jen has recently finished a book of stories, called Hider/Seeker.